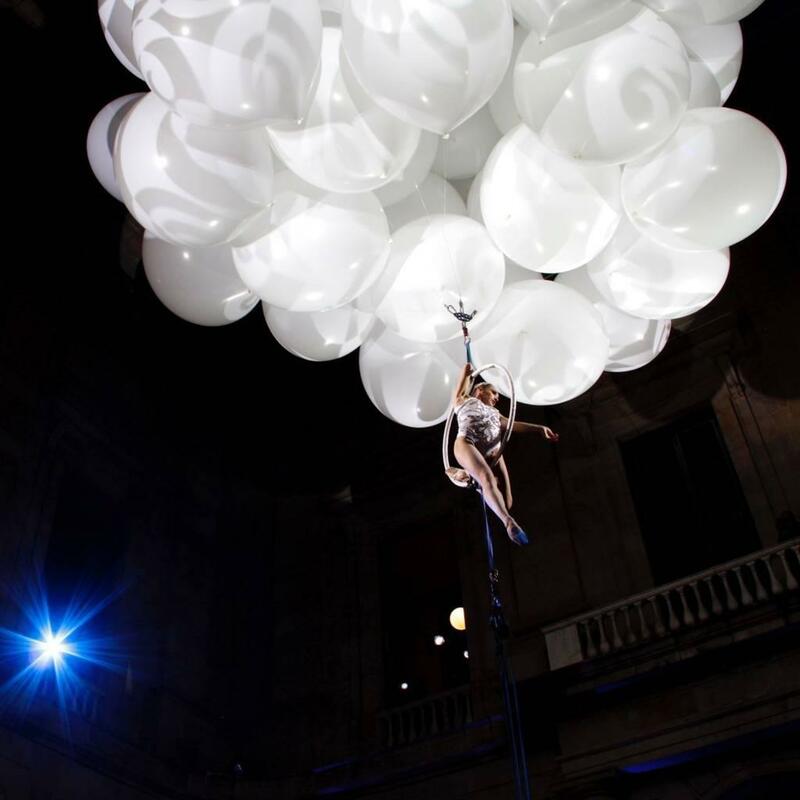 These two stunning aerial shows are made possible by the beautiful helium filled balloons and acrobats. 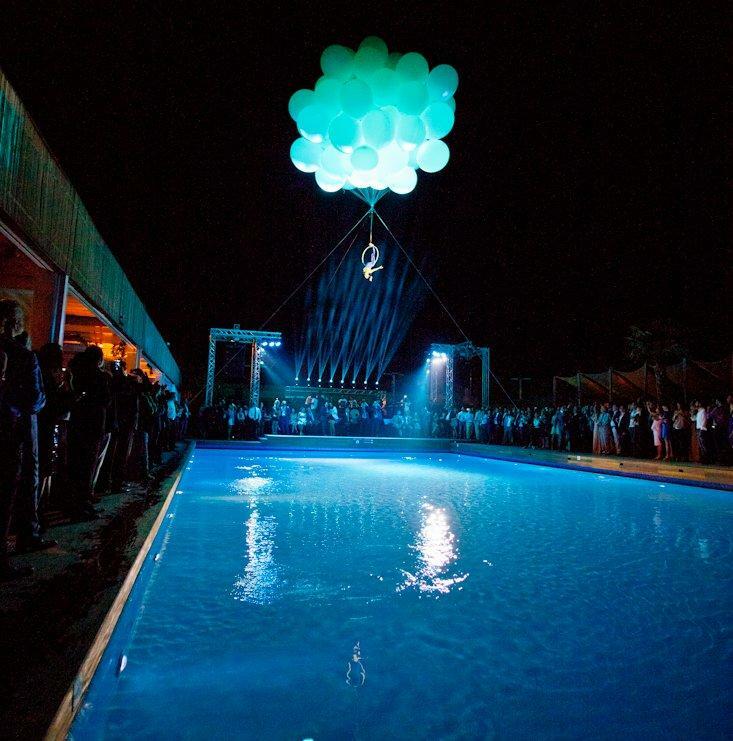 If you want a unique act that will make a huge impact at your corporate event we recommend these two acts. They are also good for festivals and exhibitions. 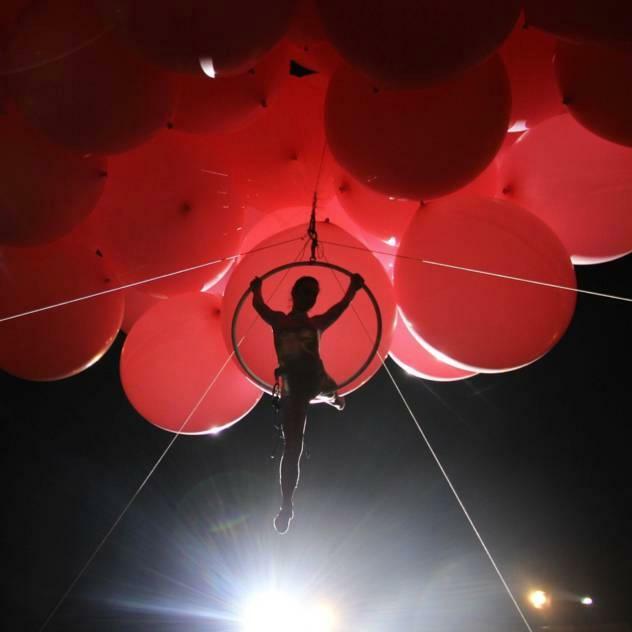 The balloons are a stunning visual display of colours and the performers are fantastic aerial artists. Helium Fantasy is an act consisting of lots of balloons filled with helium and the Helioom is an act which has just one large sphere filled with helium. 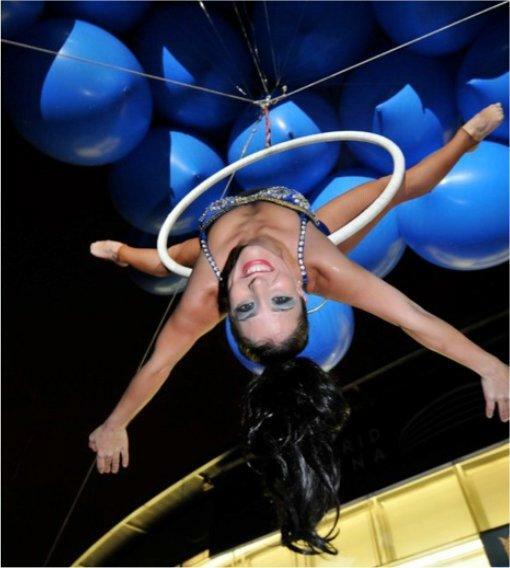 For both shows you choose what kind of aerial performances hang from the balloons as any circus apparatus can be attached to the balloons such as aerial hoop, aerial silks, spheres, etc. Balloons can be in almost any colour and they can be branded with your company’s name or logo. 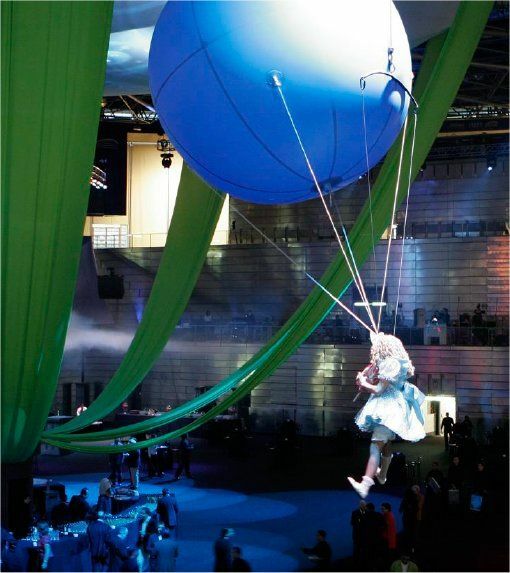 Helium Fantasy is an amazing aerial performance that fills corporate events and private functions with magic and colour! It can be performed outdoor or on a big indoor stage. 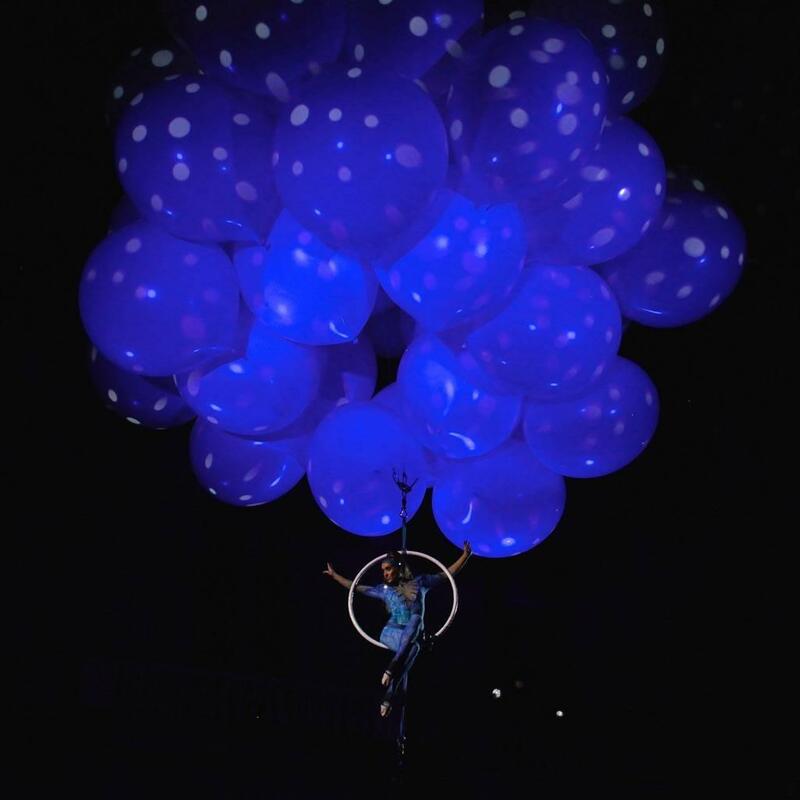 A gigantic bunch of balloons floats in the air whilst an acrobat performs underneath. This show is performed without rigs or cranes, and can be static or mobile. 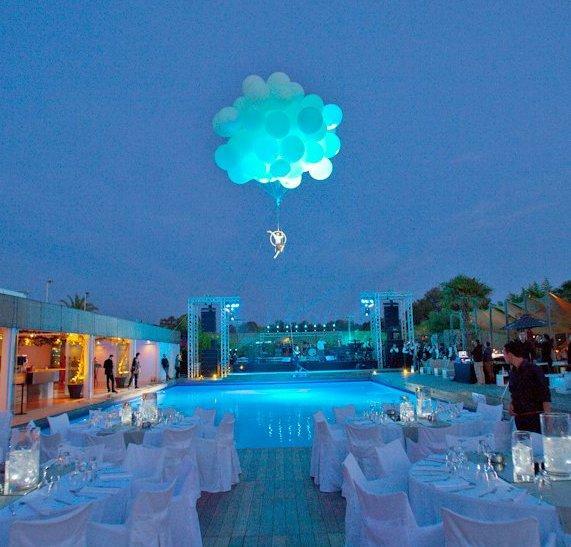 Anything is possible with Helium Fantasy! 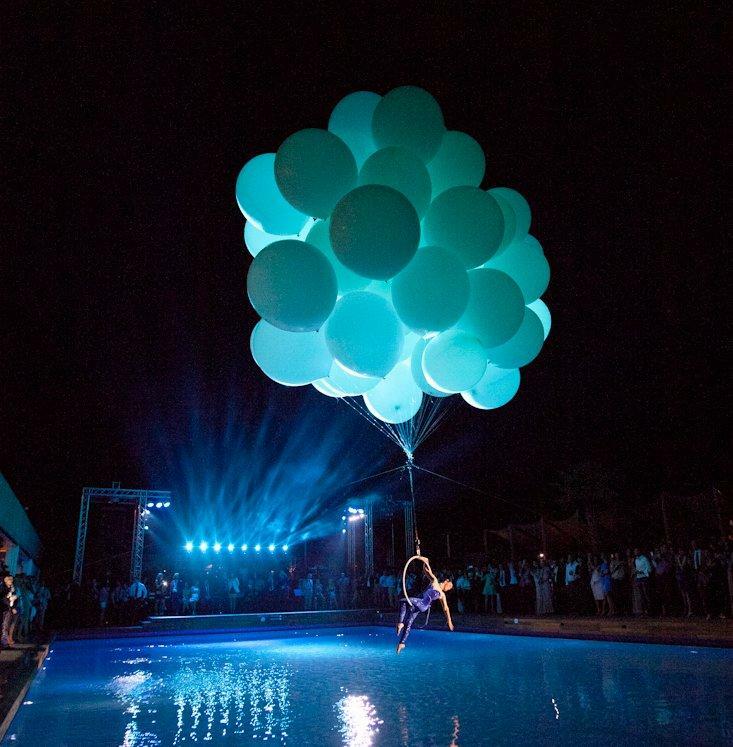 Helioom is a great centre piece for any outdoor or big indoor stage. 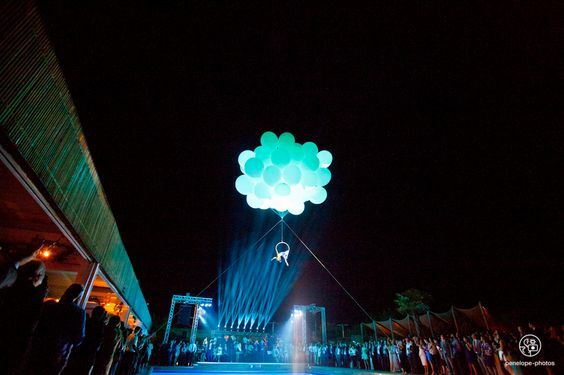 The show includes a 6 metre sphere with an acrobat suspended underneath it without rigs or cranes. It can be a static or movement show. Helioom can be illuminated from the inside. The length of performance for both shows is flexible with the maximum length being 25 minutes. 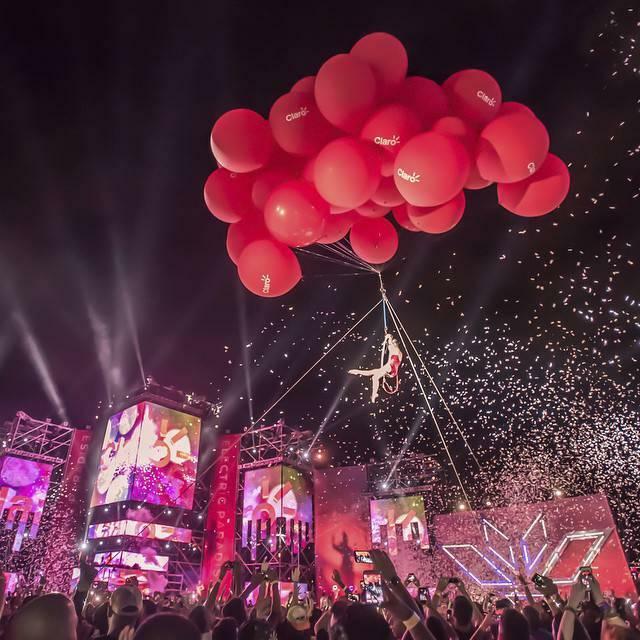 The Helium Balloon Show is an amazing aerial performance that fills any big outdoor or indoor stage with magic and colours. 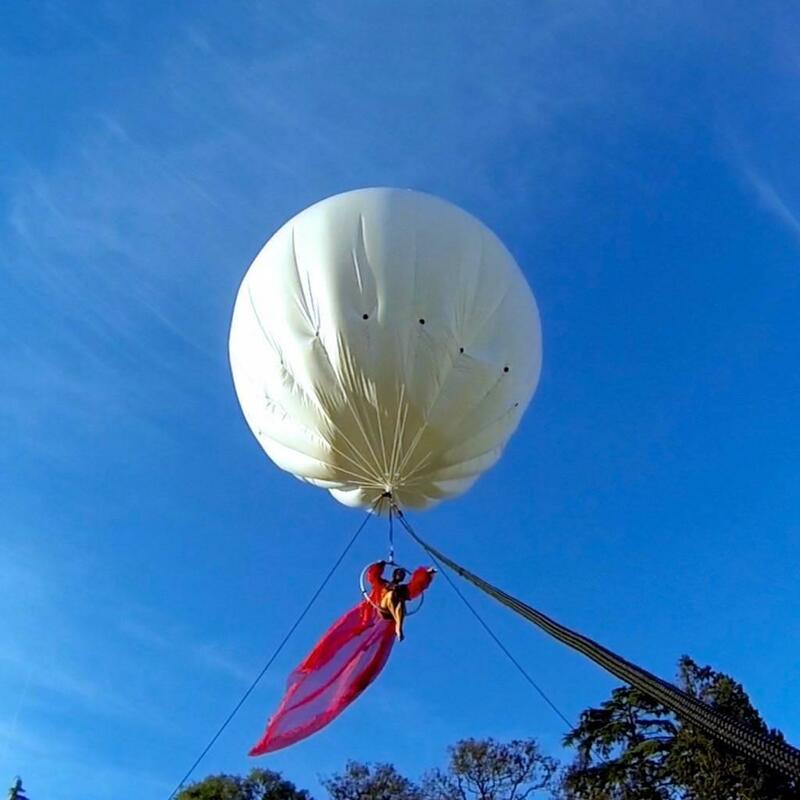 A huge bunch of big balloons and an acrobat flying with them, without rigs or cranes, static or in movement, anything is possible! Marta Gitierrez has always loved entertainment and the performing arts in general. Starting with dance and acrobatics, she then learned circus techniques and fell in love with it! To be one of the best in her field, she has to practice a lot and never stops doing dance, acting, acrobatics, conditioning work outs, dieting, etc. And, of course, also needs to be an easy going, professional and responsible person as well as a respectful co-worker.If she was to advise another person getting started in the industry, she would tell them to be patient and nice with everybody, work hard and be consistent. Besides travelling, Matra gets her inspiration from life, everything she sees and everyone she meets. She loves classical musicians, composers and music in general! About Contraband, she can only say how good all the experiences have been so far….putting us at the top of her list of agencies to work with! This is the reason why she loves so much working within the event industry, which offers her such an exciting and dynamic lifestyle! In the future, she only desires to keep on improving herself as an artist, keeping the hard work and living this great experience on a daily basis. It is very important to have good weather conditions for outdoor shows. The performance can’t be done if there is a wind blowing at 25 km/h or more. They will need at wide space and 3 hours to inflate the balloons / sphere. The crew consists of 2 technicians, 1 co-ordinator and 1 acrobat. 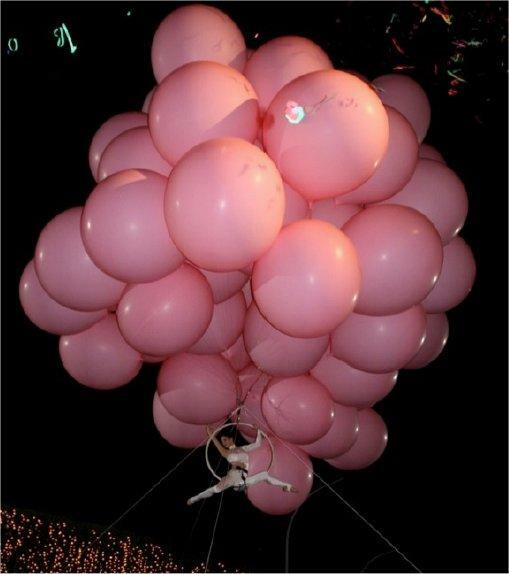 To lift a 55 kg acrobat, they need 12 bottles of 9,1m3 pure helium. 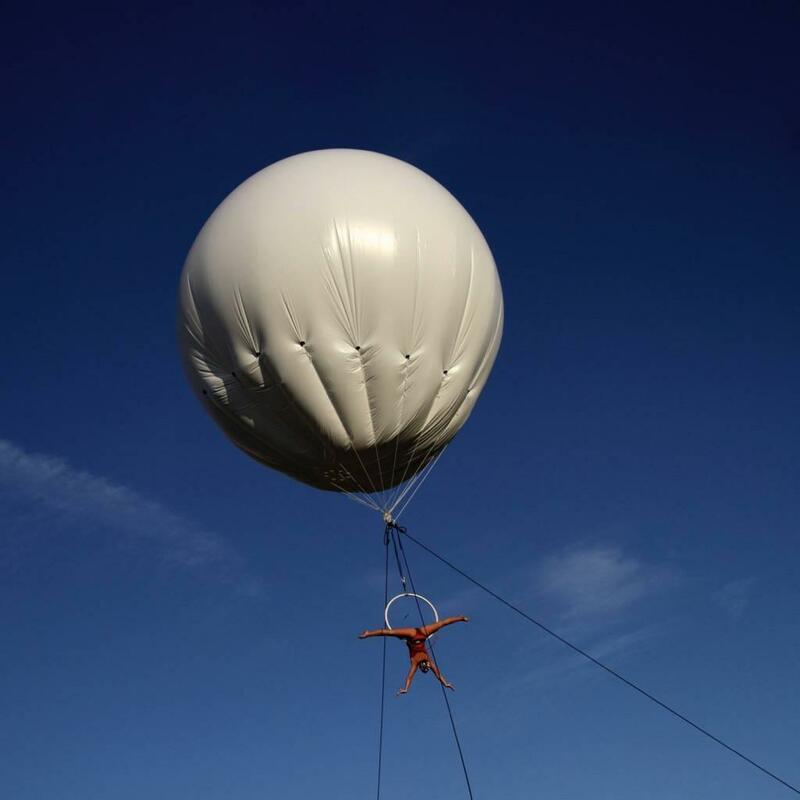 If the balloons / sphere are going to be performing at mobile show, the route must be free of any obstacles in a 12 metre ratio.